Python streamlines tasks requiring multiple steps in a single block of code. For this reason, it is a great tool for querying and performing analysis on stock ticker data. Last post, we outlined steps for calculating Bollinger Bands. In this post, we introduce a new technical indicator, Price Channels. Price Channels are lines set above and below the price of a security. The upper channel is set at the x-period high and the lower channel is set at the x-period low. For a 20-day Price Channel, the upper channel would equal the 20-day high and the lower channel would equal the 20-day low. Price Channels can be used to identify upward thrusts that signal the start of an uptrend or downward plunges that signal the start of a downtrend. Price Channels can also be used to identify overbought or oversold levels within a bigger downtrend or uptrend. Let’s use Python to compute Price Channels. 2. Define function for querying the daily high. 3. Define function for querying the daily low. 4. Define function for querying daily close. 5. 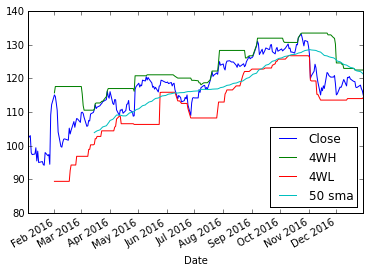 Query daily high, daily low, and daily close for ‘FB’ during 2016. 6. Compute 4 week high and 4 week low using rolling max/min. Add 50 day simple moving average for good measure. 7. Plot 4WH, 4WL, 50 sma, and daily close. In celebration of completing this tutorial, let’s watch Ed Seykota sing ‘The Whipsaw Song’. Last post, we outlined steps for calculating MACD Signal Line & Centerline Crossovers. In this post, we introduce a new technical indicator, Bollinger Bands. Developed by John Bollinger, Bollinger Bands® are volatility bands placed above and below a moving average. Volatility is based on the standard deviation, which changes as volatility increases and decreases. The bands automatically widen when volatility increases and narrow when volatility decreases. This dynamic nature of Bollinger Bands also means they can be used on different securities with the standard settings. For signals, Bollinger Bands can be used to identify Tops and Bottoms or to determine the strength of the trend. Bollinger Bands reflect direction with the 20-period SMA and volatility with the upper/lower bands. As such, they can be used to determine if prices are relatively high or low. According to Bollinger, the bands should contain 88-89% of price action, which makes a move outside the bands significant. Technically, prices are relatively high when above the upper band and relatively low when below the lower band. However, relatively high should not be regarded as bearish or as a sell signal. Likewise, relatively low should not be considered bullish or as a buy signal. Prices are high or low for a reason. As with other indicators, Bollinger Bands are not meant to be used as a stand alone tool. Chartists should combine Bollinger Bands with basic trend analysis and other indicators for confirmation. 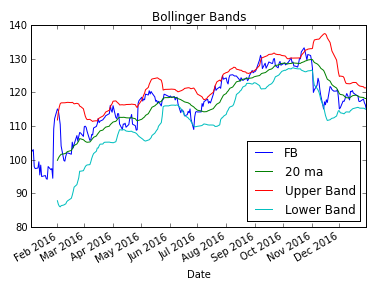 Let’s use Python to compute Bollinger Bands. 1. Start with the 30 Day Moving Average Tutorial code. 2. Compute the 20 Day Moving Average. 3. Compute 20 Day Standard Deviation. Last post, we outlined steps for calculating a stock’s MACD indicator. In this post, we take MACD a step further by introducing Signal Line and Centerline Crossovers. Signal line crossovers are the most common MACD signals. The signal line is a 9-day EMA of the MACD Line. As a moving average of the indicator, it trails the MACD and makes it easier to spot MACD turns. A bullish crossover occurs when the MACD turns up and crosses above the signal line. A bearish crossover occurs when the MACD turns down and crosses below the signal line. Crossovers can last a few days or a few weeks, it all depends on the strength of the move. Let’s use Python to compute the Signal Line. 1. Start with the MACD Tutorial code. 2. Compute the 9 Day Exponential Moving Average of MACD. 3. Create Signal Line Crossover Indicator. When MACD > Signal Line, 1. When MACD < Signal Line, 0. Centerline crossovers are the next most common MACD signals. A bullish centerline crossover occurs when the MACD Line moves above the zero line to turn positive. This happens when the 12-day EMA of the underlying security moves above the 26-day EMA. A bearish centerline crossover occurs when the MACD moves below the zero line to turn negative. This happens when the 12-day EMA moves below the 26-day EMA. Centerline crossovers can last a few days or a few months. It all depends on the strength of the trend. The MACD will remain positive as long as there is a sustained uptrend. The MACD will remain negative when there is a sustained downtrend. 4. Create Centerline Crossover Indicator. When MACD > 0, 1. When MACD < 0, 0. Now that we understand Signal Line Crossovers, let’s propose that we enter the position, ‘buy’, on 1, and we exit the position, ‘sell’, on -1. 5. Create Buy/Sell Indicator, based on Signal Line Crossovers. Multiply by 2 to increase size of indicator when plotted, so ‘buy’ on 2 and ‘sell’ on -2. 6. Plot close price, MACD & Signal Line, and Signal Line & Centerline Crossovers. There you have it! We created MACD Signal Line and Centerline Crossovers, and based on the Crossovers, plotted ‘buy’ and ‘sell’ indicators. Based on the entry and exit points, can you calculate the P&L? Stay tuned to find out. In this post, we outline steps for calculating a stock’s MACD indicator. But first, what is MACD (Moving Average Convergence/Divergence)? Developed by Gerald Appel in the late seventies, MACD is one of the simplest and most effective momentum indicators available. MACD turns two trend-following indicators, moving averages, into a momentum oscillator by subtracting the longer moving average from the shorter moving average. 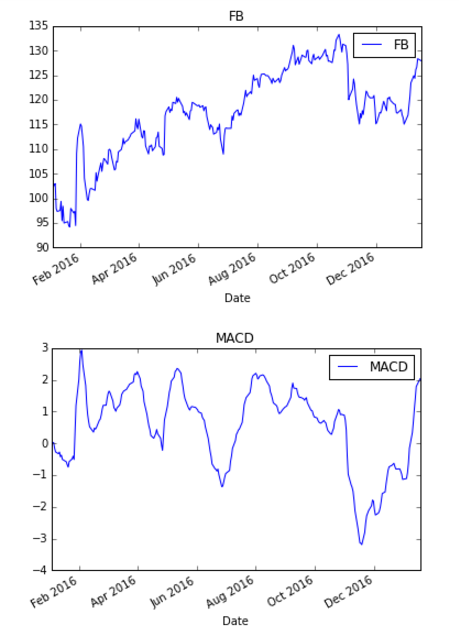 As a result, MACD offers the best of both worlds: trend following and momentum. EMA stands for Exponential Moving Average. With that background, let’s use Python to compute MACD. 2. 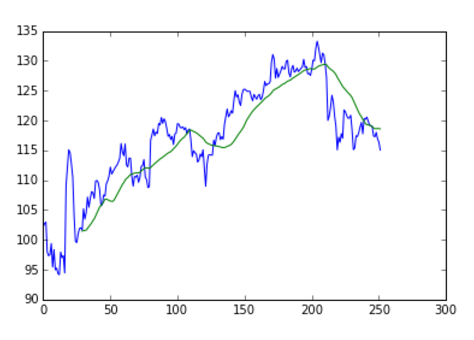 Compute the 26 Day Exponential Moving Average. We must call the column by the stock ticker. 3. Then the 12 Day Exponential Moving Average. 4. Subtract the 26 Day EMA from the 12 Day EMA, arriving at the MACD. 5. Plot close price against MACD. So when would you enter the position 😕 ? Last post we created a DataFrame containing the daily ticker data for a specific stock and calculated its 30 day moving average. In this post, we will take it a step further and plot the DataFrame in order to visualize its contents. 1. Code from last post. 2. 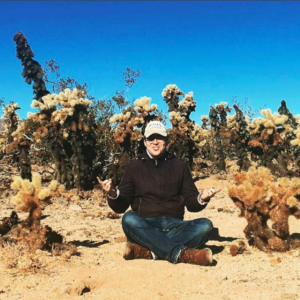 Import the matplotlib modules. 3. Call the plot function. 1. Import the pandas modules. 2. Create a list of the stocks for which you would like to query ticker data. For this example, we will pull ticker data for Facebook, ‘FB’. If you would like to add other stocks, simply add the symbols to the list separated by commas. 3. Write function to query data from yahoo finance. The function takes three arguments: the stock, the start date, and the end date. It returns the daily ‘Adj Close’. If you would like to pull a different value, simply switch it for ‘Adj Close’ without the brackets. 4. Call function for the date range, 1/1/2016 – 12/31/2016. Use the ‘for n in stocks’ logic in case you have more than one stock for which you would like to pull data. Compile query in DataFrame, saved to variable ‘px’. 5. Add new column to DataFrame in which you calculate the 30 day moving average. Call DataFrame to view contents.